What are these tiny oily beads in Lake Huron? 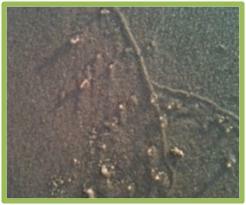 The Question: In Michigan in early July, thousands of tiny, clear, oily, bead-like things were scattered all over the beach along the water line. We were wondering if they were a natural occurrence or some kind of pollution. I was snorkeling in shallow water in a small lake in central Massachusetts today, and saw an interesting creature. What caught my eye was that a small section of the sandy gravel on the lake bottom was moving. It scooted forward about an inch (2.5 cm) and stopped. Then it did it again. I picked it up gently and turned it over to investigate. It was about 3/4 of an inch (2 cm) long and about 1/2 an inch (1 cm) wide. It was made of grains of sand and gravel glued together. Attached underneath was a small tube. The creature who lived in the tube had withdrawn and couldn’t be seen, but I knew what it was: the larvae of one of over 4,000 species of caddisflies. 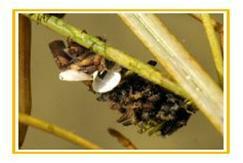 Most caddisfly larvae construct houses, which they use for disguise and protection. Each species uses characteristic materials and design. The resulting shelters range from a small tube of reed or grass, to houses constructed out of sand in the shape of a snail shell. 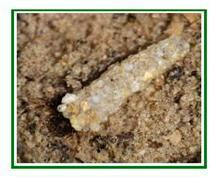 Other caddisflies actually glue tiny snail shells together. 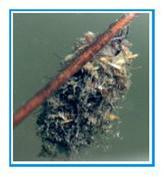 Most caddisfly larvae graze on algae and other plant material. Eventually, they leave the water and metamorphose into a somewhat moth-like adult. 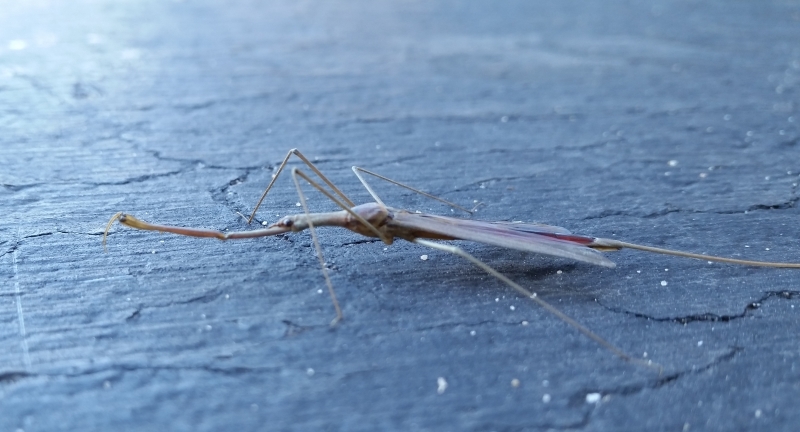 Caddisflies are, in fact, related to butterflies and moths. 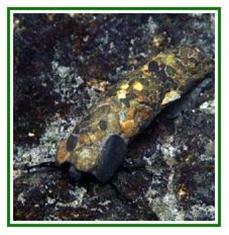 The pictures below show some of the diversity of caddisfly larvae homes. Unfortunately, none looks quite like the one I saw, and I didn’t have a camera, but a couple show homes constructed of gravel. 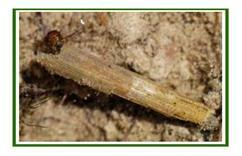 Caddisflies are often used in evaluating the health of streams. Most species are not tolerant of pollution or silted water, so to find a healthy collection of caddisflies in a stream is a good sign. What I find most amazing about caddisflies is that they are able to construct such clever, effective and attractive homes with such a tiny brain. Incredible. Cite this article as: Pelletier, TC. (July 11, 2010). Caddisfly Home Decorating Retrieved from http://askanaturalist.com/caddisfly-home-decorating/ on April 22, 2019. Are Sharks Immune to Disease and Cancer? The Question: I recently read that sharks are immune to all disease. Is this true? Some years we have many ladybugs, other years just a few. This spring they have been inside the house. When just a few, I sort of like them. When an infestation, they can be a nuisance. Can you tell me more about the life cycle of lady bugs? The Short Answer: The ladybug (ladybird in most of Europe) that has been invading houses for the last 20-30 years across most of North America and Europe as well, is the Asian Ladybird Beetle, Harmonia axyridis. As figure 2 shows, they are highly variable in color and number of spots. One way to identify them is the characteristic white areas and the distinctive M or W on the prothorax, right behind the head (figure 1). This marking is fairly clear in all but the blackest variations. As their name implies, the Asian Ladybird Beetle was originally native to Russia, China, Korea, and Japan. It was introduced at various times in the 20th Century in North America, South America, Europe and Africa to control aphids on crops such as apples, pecans, and soybeans. Sometime between 1970 and 1990 populations began to grow rapidly in the United States. Today, although Harmonia axyridis is still used by farmers to control aphids – and is still effective in that job – it also considered an invasive species that threatens our 500+ native species of ladybugs. It is now the most common ladybug in North America. Figure 3 shows the life cycle of the beetles from mating (upper left) to metamorphosis into an adult (lower right). More Info: In its native habitat, the Asian Ladybird Beetle spends the winter in large groups in cracks in rock cliffs and other open rock formations. It is also attracted to people’s homes. But the number of beetles is nowhere near the numbers reached in North America and Europe, where a single home can attract a few beetles, or a few hundreds, or millions of beetles. In small numbers, the beetles are harmless, but in large numbers, they can be annoying and destructive. They release a smelly yellow “blood” when they feel threatened. 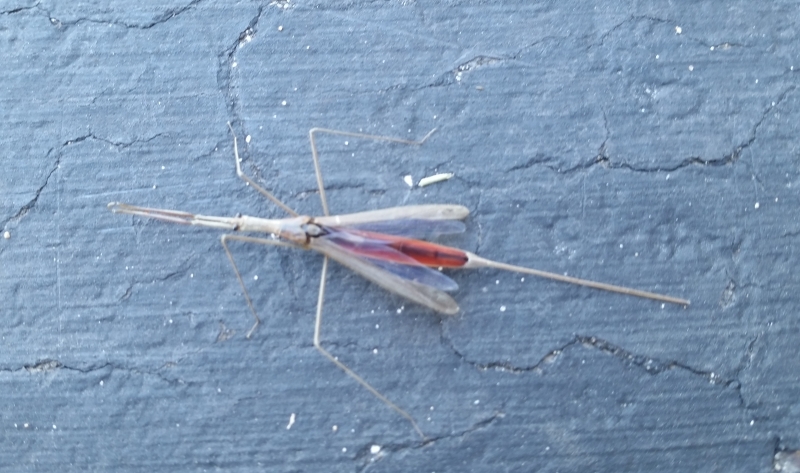 This hemolymph fluid can leave a difficult-to-remove stain and odor. The beetles can also bite, and although the bite isn’t particularly painful or harmful, people have reported being swarmed by the beetles outside their homes. Some people also appear to be allergic to the beetles and a large infestation can trigger allergy symptoms. It has been widely reported that light colored houses attract the beetles, but a study in Ohio found no difference in house color between houses with large infestations and those without. There seems to be a tendency for them to be attracted to houses with contrasting colors, and the proximity of woods makes it more likely for a house to become an attractive target. There is also some evidence that they are attracted by the scent of locations where beetles have been in prior years. The Ohio study showed a very clear pattern of when the beetles move. They tend to swarm on warm days after cold days. In Ohio, they move throughout the fall any time there is a day of 65oF (18oC) within a couple of days after freezing temperatures. There is no one easy solution to protecting your house from the beetles. It helps to seal up all cracks with caulking, tight windows and doors, etc. This has the added benefit of making your house more weather tight, of course, so it’s probably worth the effort. It’s nearly impossible to find every crack small enough to eliminate the beetles entirely, but this process can reduce them greatly. The insect repellent DEET, when sprayed around windows and doors, can reduce the number of beetles. Indoors, the most effective control is to vacuum them up. If you put a nylon sock into the vacuum tube and tape it in place, you can collect the beetles without having them go into your vacuum bag. Don’t release the beetles outside your house, or they may just come back in. The Asian Ladybird Beetle is a classic example of the danger of introducing a generalist predator to control agricultural pests. 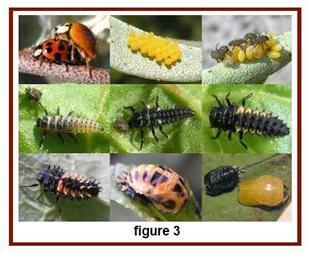 The larvae of the Asian Ladybird Beetle not only eat the aphids they were meant to control, but also the eggs, larvae, and sometimes the adults of other ladybugs and other insects as well. Because they taste bad, few birds will eat them, although the Grey-Headed Woodpecker and the Eurasian Nuthatch, two Eurasian species, seem to be exceptions. Most predators and parasites that might be introduced to control the Asian Ladybird Beetle are just as happy to prey on our native ladybug species as well. So until some natural control arises, due to disease or adaptation of predators, we are probably stuck with large populations of Harmonia axyridis. If we could figure out how to keep them out of our houses, most of us would probably never notice the growing population of Asian Ladybird Beetles, and sadly, we probably wouldn’t notice the loss of our native ladybugs either. Farmers still value the Asian Ladybird Beetle’s ability to protect crops from aphids, although they can be a problem for grape growers because of their tendency to feed on damaged fruit. They will often get into grape bunches and when the grapes are harvested and processed, the beetles are crushed, releasing their noxious fluid, which can taint grape juice or wine with an unpleasant smell. Trivia #1: A ladybug is technically a beetle, not a bug. Scientifically, bugs are members of the insect order Hemiptera. The Hemiptera include insects with sucking mouthparts such as aphids, cicadas, leaf hoppers, and shield bugs. True beetles on the other hand, are members of the Coleoptera. One of the distinguishing characteristics of the true beetles is sheathed wings. If you ever see a ladybug lift off, you’ll noticed that the hard red and black sheaths move aside to let the hidden wings carry the beetle away. For she has crept under the warming pan. The Interesting Science: I was unable to find any research on why there are more beetles some years than others. Variations in the population levels of their prey and in climate probably play a role. Most studies of population fluctuations of predators are on big predators such as cats, canids (wild dogs, wolves, foxes, etc. ), and bird raptors. While ladybugs are predators, they also have the ability, common to insects, to multiply rapidly. Mammals and birds are limited in how fast they can increase their numbers to take advantage of a booming prey resource, but ladybugs probably react much more quickly. This may lead to larger boom and bust cycles for ladybugs, than for larger predators, but again, I haven’t seen any research on this. 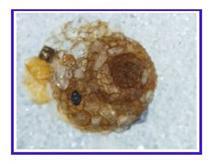 Current and potential management strategies against Harmonia axyridis. Kenis M, Roy H, Zindel R, Majerus N. BioControl 53(1), 235-252, 2008. 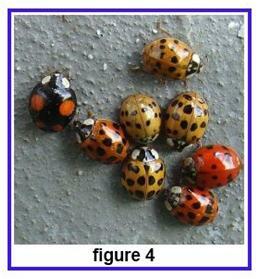 Multicolored Asian Lady Beetle (Harmonia Axyridis) as a nuisance pest in households in Ohio. Heulsman M, Kovach J, Jasinski J, Young C, Eisley B. Proceedings of the 4th International conference on Urban Pests, Jones S, Zhai J, Robinson W, editors, 2002. Bad side of a good beetle: the North American experience with Harmonia axyridis. Koch R, Galvan R. BioControl 53, 23-35, 2008. Cite this article as: Pelletier, TC. (June 14, 2010). Ladybird, ladybird, fly away home Retrieved from http://askanaturalist.com/ladybird-ladybird-fly-away-home/ on April 22, 2019. Cite this article as: Pelletier, TC. (April 19, 2010). Where Does Trash End Up? Retrieved from http://askanaturalist.com/where-does-trash-end-up/ on April 22, 2019.